1. Put the cranberries and star anise in a medium saucepan with 150ml water. Bring to the boil over a medium heat and simmer for 5 minutes, until a few cranberries burst. 2. Add all the remaining ingredients and continue to simmer briskly, stirring often, for 10 minutes, or until the mixture is thick and jammy. Add a little more water if it gets too thick. Remove the star anise, ladle into sterilised jars and allow to cool. 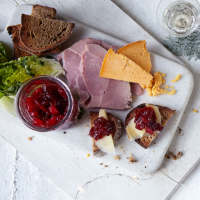 Store in the fridge for up to 1 week and serve as a tangy sauce for ice cream, a cake filling or an accompaniment to a ploughman’s-style platter.